Things between Japan and China are heating up over a territorial spat. 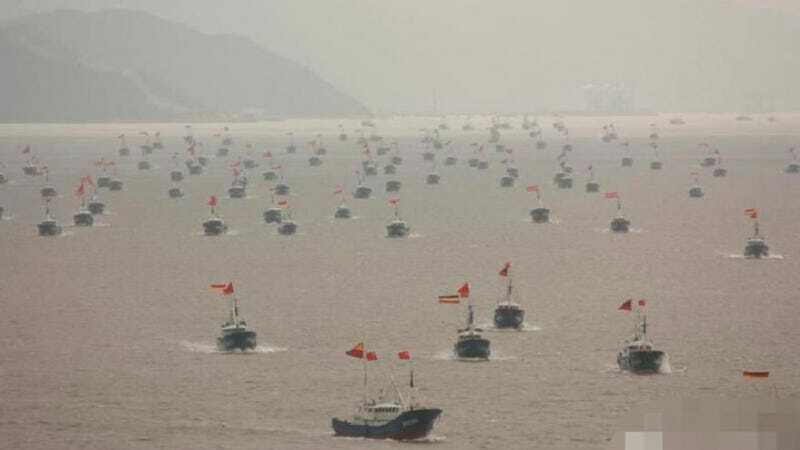 One thousand Chinese fishing vessels set sail and will land in the disputed islands known as "Senkaku" in Japanese and Diaoyu in China. The "one thousand" number is from China National Radio. Here are photos of the ships. The scene looks like something out of classic mythology. Complicating the issue is the fact that two Japanese citizens landed on the islands this morning. China (and Taiwan) says the islands have been part of their territory since 1534, but acknowledge that Japan took control of them in the 19th century. However, China says Japan had to give up control of the islands after World War II. The U.S. government controlled the islands after that war and returned them to Japan in 1972. The islands are uninhabitable; however, in 1968, oil reserves were believed to have been located in their waters.